Select Your Favorite Style and Color... 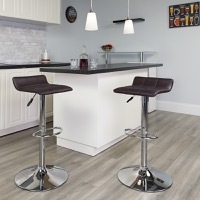 These sleek dual purpose stools easily adjusts from counter to bar height. The backless design is casual and contemporary which allow it to seamlessly accent any area in the home. The easy to clean vinyl upholstery is perfect when being used on a regular basis. The height adjustable swivel seat adjusts from counter to bar height with the handle located below the seat. The chrome footrest supports your feet while also providing a contemporary chic design. VQV Furniture Group offers commercial and residential bar seating.